Last year the Last Star shoes made headlines good and bad. The headlining shoe out of that Collection was the Galaxy Foamposites which caused quit a stir even some areas had to have swat sent in for the release. This year the headlining shoe will come from the Foam family. The Barkley Posite Max a new hybrid from Nike will be the top shoe to drop this All Star weekend, this shoe was a crazy mix featuring a speckled midsole and a 3m upper. At the bottom of the shoe features the words "Not a Role Model". Hopefully this releases ill not be as crazy as last years releases. Check out the detailed images. Every year Nike and Jordan Brand celebrate the Month of February also Known as Black History month. Many unique and amazing looking kicks are put together to commemorate this month. With a few more BHM release still Left we give you a look at the Upcoming Jordan Retro 1 High "BHM" 3M. The upper features a all dark charcoal color with blue splatter all throughout the upper. 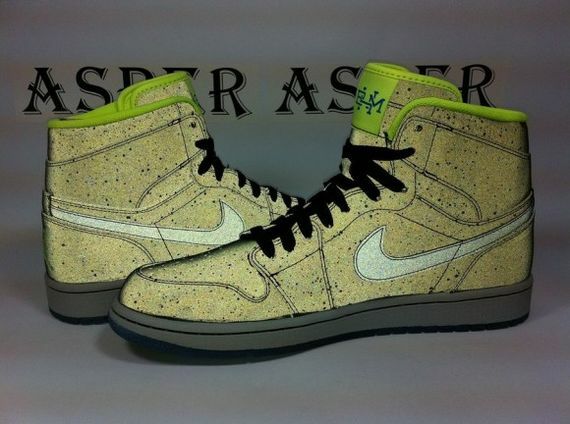 The bottom is a icey obsidian color with Volt splashes. The tongue features a BHM logo done in volt colorway. Thats not the biggest surprise for this shoe. The whole upper is complete 3m the first time seen on a retro 1. How do you feel about this BHM themed Jordan Retro 1 High? 2006 was the last time that the popular grape Colorway Retro 5 dropped. Set to drop again In May this colorway will be a hit with many sneakerheads worldwide. The colors are of course similar with a softer tone of Emerald Green on the newer version. All white upper and Mesh tongue still come with the classic colorway. Check out the new images of the Upcoming Jordan Retro 5 "Grapes" will this be a for sure cop for you? Many have waited years for a release like this, some never thought it could happen. But dreams do come true! Nike/JB will be dropping the Nike Air 88' Retro 3's on Feb. 9th. So far this release is looking like a online only release. Set to drop on nikestore.com at 4:51pm. Many are still holding on to hope that their local store may come up on a few pairs but it is looking unlikely. Retail Will be a astonishing $200, but good news is quality seems to be on par. Leather and shape has been upgraded to give it that OG look. Will this be a cop for you? Good luck to all those trying to cop. With the success of the Jordan Retro 1 High "Bulls" and "Knicks" JB will continue to dish out a hefty dose of Retro 1's this year. The next Retro 1 on the line will bring us back to MJ'S college days with a classic University Blue look. The Retro 1 Is a Mid this time around not a high but still is a popular and classic colorway. No Nike Air on the tongue once again so we will be seeing a Jordan wing logo box for these. Check the new images out and let us know what you think. Look for these to Drop Feb.16th. The shoe was made iconic by the Man that changed the sport of Basketball, but was made famous by Denzel Washington in the Classic Movie "He Got Game" ever since the movie launch this shoe has been a must cop for most sneakerheads. Look for this iconic shoe to drop in March and will certainly be a sell out. The shoe features a classic Chicago colorway, will this be a must cop for you? Its been a while since we heard news of the Invisibility Cloak Penny V's we started to wonder if they where ever coming out or where we just left with sample images. But now its confirmed and the Popular colorway will indeed be releasing in March. We see the upper featuring that classic Eggplant two-toned colorway, black mesh flywire upper and hints of Turquoise and white. The same colors can be found in the upcoming Barkley Posite max as well and similar to the Barkely's the bottoms of the Invisibility Cloak Penny's is also GID. This is by far one of the top colorways of the Penny V'S to drop thus far this year. Take a look at the pictures let us know what you think about this colorway. This year Marks the Chinese Year of the Snake. Nike will be cashing in on this just like previous years by starting off dropping 2 classics. Air Force 1 Low and High will be given that YOTS treatment. With this premium look we are sure Nike will add a premium price. The low top model is the more colorful option receiving a red upper with alternating snake to suede paneling. The outsole and liner use purple as a contrast and all of this sits on a very unique snake skin midsole. The high top version features mostly black for the base, but uses an authentic looking snake print for the toe box. 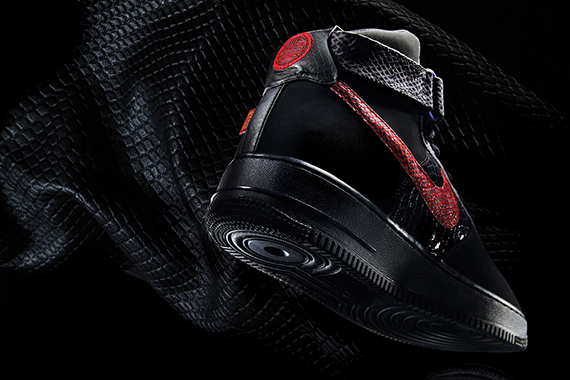 Black and blue snake print makes up the mid panel and strap, while a red snake is used for the Swoosh. Stay tuned to TCC For more info and release dates. What do you think of these? Continuing the BHM theme JB will do another first and Add the Jordan 1 to the BHM lineup this year. Take a look at the Upcoming BHM Jordan Retro 1 High. Your upper is Dark Charcoal with splatter blue paint all over it. Your sockliner and Tongue tag features the same Volt color seen in the Spiz'ike. The BHM logo on the tongue is also done in blue. Bottom of the shoe is translucent Blue with splatter volt paint. The biggest surprise of this shoe is the upper is completely 3M and with flash makes the upper Volt as well. What are your thoughts about these? Stay tuned for a release date.